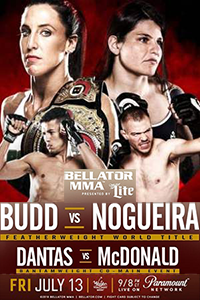 Bellator 202: Budd vs. Nogueira took place July 13, 2018 at WinStar World Casino and Resort in Thackerville, Oklahoma. • Daniel Carey vs. Aaron Webb: Daniel Carey defeats Aaron Webb via submission (rear-naked choke) in Round 2. • Julia Budd vs. Talita Nogueira (Women's FW Championship): Julia Budd defeats Talita Nogueira via TKO (strikes) at 4:07 of Round 3. • Eduardo Dantas vs. Michael McDonald: Michael McDonald defeats Eduardo Dantas via knockout (strikes) at 0:58 of Round 1. • Chris Honeycutt vs. Leo Leite: Chris Honeycutt defeats Leo Leite via unanimous decision (30-25, 30-25, 30-25). • Ernest James vs. Valentin Moldavsky: Valentin Moldavsky defeats Ernest James via TKO (strikes) at 4:03 of Round 2. • Will Morris vs. Charles Williams: Will Morris defeats Charles Williams via unanimous decision (30-25, 30-27, 30-26). • Veta Arteaga vs. Emily Ducote: Veta Arteaga defeats Emily Ducote via unanimous decision (29-27, 30-27, 30-27). • Gerald Harris vs. Yaroslav Amosov: Yaroslav Amosov defeats Gerald Harris via unanimous decision (30-26, 30-27, 30-27). • Steve Kozola vs. Ryan Walker: Steve Kozola defeats Ryan Walker via TKO (punches) at 1:45 of Round 1. • Jon Hill vs. Rudy Schaffroth: Rudy Schaffroth defeats Jon Hill via TKO (strikes) at 0:42 of Round 1. • http://blog.mmaratings.net/search?q=STARS+RATE+Fernando+Gonzalez vs. Tyler Ingram: Tyler Ingram defeats Fernando Gonzalez Trevino via submission (rear-naked choke) at 4:13 of Round 2. • Luis Erives vs. Nation Gibrick: Nation Gibrick defeats Luis Erives via submission (heel hook) at 1:30 of Round 1.